Guide For Peer Mentors” with Dr. Ruth Frisz. potential far outweighs those challenges. justice and community outreach programs. At Southern, he succeeds Dr. Mary A. University of New York (SUNY) system. Meet the four Southern graduates who received the 2016 Henry Barnard Distinguished Student Award. Gifted educator Jahana Hayes, ’05, is inspiring the nation as well as her students. Artist Benjamin Komola, ’11, breathes new life into fallen trees through his work at City Bench. TerrifiCon™ founder Mitch Hallock, ’89, brings the world of comic books to his fellow fans — because with great power, comes great responsibility. When many in the Republic of Zambia see a problem, Mawano Kambeu, ’08, knows there’s an opportunity. Once an Owl, Always an Owl! It’s easy to join Southern’s first alumni owl watch. Just take a photo that includes the enclosed card and share it with us — extra points are given for creativity. As the recipient of a Gates Millennium Scholarship, Shaylah McQueen, ’16, received full tuition to the university of her choosing. Here’s why Southern was the perfect choice. In the process of earning his Ph.D. in England, Mark McRiley, M.P.H. ’12, sets out to investigate opiate use on both sides of the Atlantic. taken the helm at San José State University in california, bidding Southern a fond farewell after serving as president since February 2012.
the school of education and school of Business participated in an evening ceremony. Commencement highlights including videos, photos, and more are at go.southernCt.edu/scsu2016. judged on numerous factors, including a community outreach project. Southern’s team members are assisting with professional development workshops designed for middle and high school science teachers. this is the first time Southern has taken part in the competition. at press time, ScSU joined Yale and the University of connecticut as the only colleges from the state represented. “this is a terrific opportunity for our students to showcase their talents and abilities,” says nicholas edgington, associate professor of biology. Undaunted by the highly competitive field, the group cites raising necessary funds as their biggest challenge. Several ScSU organizations, including the office of SteM Innovation and Leadership, the cScU center for nanotechnology, the Biopath Initiative, and the office of the Dean of arts and Sciences, have provided support. But additional funding is needed. Southern Connecticut State University Office of Integrated Communications & Marketing/Southern Alumni Magazine 501 Crescent Street New Haven, CT 06515-1355 Telephone (203) 392-6591; fax (203) 392-6597 E-mail address: StruykV1@SouthernCT.edu University website: SouthernCT.edu Printed by The Lane Press, Inc.
2015 passed the family nurse practitioner Certification exam, a standard recognized in all states in the u.s. southern’s nurses excelled on the examination, earning an average score of 604, significantly higher than the national average of 561. this is the tenth consecutive year that 100 percent of southern graduates have passed the fnp examination, which is overseen by the american academy of nurse practitioners national Certification Board. the fnp program is designed for those with a bachelor’s degree in nursing, who want to earn a master’s degree in the field. required to pay $230 for the course. roberts (left) joined two Southern biology majors at the Washington, D.c.–based posters on the hill program, which is sponsored by the national council of Undergraduate research. their student project was one of only 60 chosen from throughout the nation to be presented to members of congress, congressional aides, and representatives of federal agencies. In an advanced microbiology course last spring, Jacqueline Mary Desrosier, ‘15, discovered a bacteria that may have valuable antibiotic properties. the course, part of a nationwide program called the Small World Initiative, enabled students to isolate soil bacteria in the hopes of finding new antibiotics. Desrosier and Laeticia Iboki, ’16, (right) studied this “good bacteria,” and showed that it not only killed harmful bacteria, but also helped tomato plants grow larger and withstand heat stress. once an owl, always an owl! turn to page 23, snap a photo, and share your Southern pride at #southernowls. a team of ﬁnance students display a ﬁrst place trophy after winning the inaugural statewide venture Capital investment Competition: (from left) sam andoh, dean of the school of Business; may graduate egzon dauti, ’16; Benjamin abugri, chairman of the department of economics and finance; student alec santo (holding trophy); and student paul Barlow. competition, which was organized by the entrepreneurship foundation. a hearty owl welcome went out to many accepted southern stu dents, who received hand-written congratula tory postcards. “the tremendous sense of community is what’s truly shaped my life,” says political science major cory evans. every student has a story. For more on evans’ go to southernCt.edu/go/ corey-video. erans have given so much to their country, and this is one way in which we can help them,” says Julie liefeld, who serves as director of the clinic and the sCsu marriage and family therapy program. the new program was established in collaboration with Jack mordente, m.s. ’77, 6th yr. ’79, southern’s coordinator of veterans’ and military affairs. “veterans are never going to forget their experiences, but this program will help them come to terms with it,” says mordente, a veteran who served during the vietnam War era. “it will give them and/or their families another form of support.” the family Clinic is staffed by faculty in the sCsu marriage and family therapy program, as well as many advanced graduate students. for more information, call the clinic at (203) 392-6413.
annual Mary and Louis Fusco Distinguished Lecture Series on May 6, thrilling the sold-out audience, which included many cancer survivors, with her message of hope. Drawing on grace, heart, and humor, roberts talked about overcoming breast cancer in 2007 — only to learn five years later that she would need a bone marrow transplant to combat a rare blood disorder. a portion of the proceeds from the event support Southern’s endowed awards of excellence, a merit-based scholarship program. Southern’s campus, helping to keep the community safe and secure. 21st century communications Magnet and ScSU Lab School. 100% of new construction on campus is Leadership in energy and environmental Design (LeeD) certified by the U.S. Green Building council. From the pool to the playing field, a look at Southern athletics. in 2014, Michael Mallory was named the northeast-10 rookie of the year in men’s basketball. two years later, mallory — now a senior communication major — has lived up to the honor, setting the following records. • Single-game scoring for the owls: Mallory scored a record 47 points and 10 three pointers against Bentley University on Jan. 3. he also holds the record at Bentley’s Dana center for most points in a single game. • Southern’s all-time three point leader, both made (260) and attempted (670) • currently sixth on Southern’s all-time scoring leaders list with 1,795 points. Stay tuned! by the Walter camp Foundation — an honor that recognizes his integrity, commitment to service, and professional achievement. a two-time all american while at Southern (1993-96), andruzzi won three Super Bowls while playing for the new england patriots from 2000 – 2004 and was named to the squad’s all Decade team. he also played with the Green Bay packers and the cleveland Browns. off of the field, andruzzi and his wife, Jen, have worked tirelessly to support the community. In 2007, he was diagnosed with non-hodgkin’s Burkitt’s lymphoma. Following his recovery, he and his family founded the Joe andruzzi Foundation, dedicated to furthering cancer research and supporting cancer patients and their families. om Diana, ’89, the head varsity basketball coach and a teacher at uniondale high school, was inducted into the new york state Basketball Coaches hall of fame on march 13. in his 20-year career, diana has won 314 games and guided his teams to victory in three long island regional championships, seven nassau County Championships, and 15 conference championships. record-setting 216 studentathletes were named to the northeast-10 Conference Commissioner’s honor roll for the spring 2016 semester. students who were recognized earned a 3.0 or higher semester grade point average. tied for the most sacks in the northeast-10 conference’s regular season (7.5) last year and had the third most tackles for the owls (58) in 2015-16.
amateur athletic Union [aaU] for four years. In addition to teaching the fundamentals of the game, he says he stresses the importance of earning good grades, applying to colleges, and seeking scholarships. reflection: Before each game, Bynum remembers several friends and loved ones who have died by writing their names on his taped wrist. the owl Club includes donors who support southern’s athletic program with a gift of $50 or more. to make a gift, go to southernCt.edu/giving. goals: he wants a career in coaching and, ultimately, to run a sports facility. exclusively online. Subscribe to the free newsletter at southernCtowls.com; click on the “owl Club” heading. alumna named national teacher of the year Gifted educator Jahana Hayes,’05, is inspiring the nation as well as her students. settle down,” joked President Barack Obama, minutes before presenting her with the 2016 National Teacher of the Year Award at a White House ceremony on May 3. A N D T H E AWA R D GOES TO . . . A SOUTHERN GRAD! southern is proud of educating the most teachers, principals, and superintendents in the state of Connecticut. in our humble opinion, they’re also the best — a popular view based on the many sCsu alumni who received top educator awards this year. Connecticut superintendent of the year, Connecticut association of public school superintendents • colleen palmer, M.S. ’90, 6th Yr. ’93, then with Weston Public Schools; In July she began serving as superintendent for the neighboring town of Westport 2016 school Counselor of the year, state representative for Connecticut • Megan Johnson, M.S. ’98, 6th Yr. ’99, King Philip Middle School, Hartford outstanding Connecticut art educator, Connecticut art education association • Mary Lou carlson, M.S. ’73, Fairfield Warde High School outstanding elementary art educator, Connecticut art education association • Walter Lewandoski, ’77, South Side School, Bristol, Conn.
• patricia c. Moran, M.S. ’95, supervisor of early childhood education for the city of Waterbury The honoree was one of five scholars and educators presented with the prestigious insignia at a ceremony at the French Embassy in New York City. can make a difference in the world. This honor makes that real for them.” ■ The National Teacher of the Year program is run by the Council of Chief State School Officers (CCSSO) and presented by Voya Financial. TerrifiCon™ founder Mitch Hallock, ’89, brings the world of comic books to his fellow fans -- because with great power, comes great responsibility. great stories on film,” says hallock. his own story is intrinsically tied to southern. future wife, sharon, while working on a production. star as a superhero in a major motion picture. he can remember. His earliest memories include drawing Fred Flintstone on the wall of his home. He was 3.
strip, and I’d send it in under a different name. I think I was hal Mitchell at one point . . . “ Hallock kept drawing. “after college I got a job at a studio in Branford. I was 23, working as an assistant art director when my boss was fired. It was 1989 — I was making $17,000 a year — and the owner said he’d give me a raise if I could do the work for six months.” Hallock also kept thinking about comics. “So I was working on a catalog for office supplies and I thought, hmm, what will work? What do I know? the answer was comic books. . . . I came up with a story about a guy who has to make a presentation at work. he’s a complete wreck. then he hears a voice from the heavens that tells him to use these products. . . . So I made the pitch to do a comic — and they liked it. “I met Michael Jai White at that same convention in new York city. he was promoting ‘Black Dynamite,’ a hysterical movie, which he [co-]wrote and starred in. . . . he looked familiar, so I asked him if he had gone to Southern? he said yes — and then it hit me. So I asked him, ‘Were you Larry the Lobster?’ It was a crazy play we did about a lobster about to be boiled. . . . I was working stage crew. he was Larry. . . . Does anyone have a photo of Michael Jai White playing Larry? Because if they do, I want it to blackmail him.” Hallock continued to love comic cons. a tie to southern’s past, founders Gate is part of a newly instituted tradition: each fall, the incoming class enters campus through the gate following new student Convocation. in the spring, graduating seniors will cross it again to mark the culmination of their undergraduate experience. the gate spans the area between lyman Center and engleman hall, but originally stood on the school’s howe street campus. after being restored and moved to its current location, it was dedicated during homecoming in 1987.
is it an owl’s outstretched wings, an open book evoking the quest for knowledge, or, perhaps, both? perched on top of enGleman hall , this sculpture can be seen throughout much of southern’s campus. every cloud has a silver lining, and, on campus, it’s the rain harvester located outside of the academic science and laboratory Building. named in recognition of the south Central Connecticut regional Water authority for its leadership-level support, the rain harvester is ecologically sound as well as beautiful. Water drains into a 40,000-gallon underground collection system that is used to water surrounding greenery — reducing the need for irrigation of the area by 50 percent. an ultravioletpuriﬁcation system eliminates bacteria. those who haven’t mastered southern’s sundial turn to the hilton C. Buley CloCk . the bars light up in blue to show the hour, while the dots glow a golden hue for minutes. the clock was installed in 2015 as part of the renovation of the original section of the library. for a picturesque view of campus, go to the fourth ﬂoor of the library and look out of the clock’s transparent face. incoming students are invited to learn many things during orientation, including how to tell time using the nearly 50-foot-toWer sundial found on engleman hall. Built in 2005 of precast concrete and aluminum, the sundial is an award winner. the american institute of architects’ Connecticut chapter recognized it as the top design in the art/architecture category in 2006. the project’s architects are howard hebel (herbert newman & partners) and frederick sawyer, who is a co-founder of the north american sun dial society. So turn the page, fill in the blank, and show your Southern pride by sending us a selfie or other quick snapshot. Be creative! Take a photo of your kids. You at home. One from the road. Or a shot of your choice. Photos will be shared online, and we hope to spotlight several in an upcoming issue of Southern Alumni Magazine. he aCademiC sCienCe and laBoratory BuildinG’s neWest tenants have arrived. Why Your Gift Matters Southern’s tuition has always been low. Do students really need my help? the faCts: historically, Southern has provided students with an exceptional education at a low cost. Many alumni who attended the university in the 1960s recall paying only $100 annually for in-state tuition! It’s a different world for today’s students. at the national level, tuition costs have risen much more quickly than family income. ScSU’s in-state tuition and fees for the upcoming academic year are $10,054 — excluding room and board. that’s still a tremendous value compared to local four-year private colleges. In fact, undergraduate tuition/fees at four competing private universities in connecticut are almost triple to more than four times higher than at ScSU. But for many Southern students, financing their education remains challenging. overall, about 77 percent of Southern undergraduate students rely on some form of financial aid. of these, 32 percent of undergraduates receive federal pell Grant support, which is awarded to those determined to have high financial need based on the Free application for Federal Student aid (FaFSa). SCSU is a public university . . . so why does it need more support? the faCts: In 2002, the state covered 47 percent of Southern’s budget. In 2015, that number had fallen to only 33 percent. With connecticut facing significant budgetary challenges, this decline is likely to accelerate — one more reason why gifts from alumni, friends, and members of the corporate and foundation community have never been more important. complicating matters, tuition and fees cover only 49 percent of the cost of a Southern education. Your gifts keep Southern affordable, accessible, and exceptional. Gifts in support of Southern and its students are made to the ScSU Foundation, Inc., a nonprofit organization established in 1972. the foundation advances the university’s fundraising efforts by soliciting, receiving and administering gifts, and managing the endowment. Its overall goal is to provide the ongoing support Southern needs to fulfill its mission on campus and in the community. I thought universities only cared about major gifts. What difference does my “small” gift make? the faCts: Last year, gifts to the ScSU Foundation of $250 and less totaled $238,500. that’s enough to provide Undergraduate research Stipends of $3,000 to 79 students — or to cover half of the annual in-state tuition and fees for 47 students. think of it this way. Southern has more than 92,000 alumni. If each joined the ScSU alumni association by making an annual gift of $35, we’d easily raise more than $3.2 million for Southern and its students! alumni gifts — regardless of the amount — also enhance Southern’s reputation and can help the university secure additional funding. 1) alumni participation is one factor used by US News & World Report and others when compiling rankings of colleges and universities. 2) In addition, some foundations review the level of alumni support when evaluating universities’ requests for major grant funding. 3) Last but not least, many employers will match your contribution — easily increasing the benefit of your gift. Your support of the university and its students has never been more important. Hereâ&#x20AC;&#x2122;s why â&#x20AC;&#x201D; including answers to some common questions about giving. course loads during the fall and spring semesters. a testing ground known as the “proof of ability” program. academic promise, despite inconsistencies in their grades. the proof of ability challenge in earnest. “i wanted to prove to myself i could do it,” dearborn says. “those two classes were intense for me.” despite the pressure, she passed those courses — a writing composition and a communications class — with flying colors. she would be allowed to enroll for the fall. with a bachelor’s degree in art and a concentration in sculpture. The discovery, found near Halloween, made international headlines, and researchers later traced the remains to the 1790s, when the green was used as a burial ground. The tree was planted in 1909 to honor Abraham Lincoln’s 100th birthday. “It was such an interesting piece to work on. It’s so historically connected to the city,” says Komola. “But, honestly, almost everything I do here I find to be incredibly interesting.” Komola is an artist and the chief furniture builder for City Bench, a business that turns old and dying trees into artistic furniture. Brothers Ted and Zeb Esselstyn founded the business in 2010 as a way to breathe a second life into downed trees that were destined for landfills. Komola joined the company in 2013. Most of City Bench’s raw material comes from the city of New Haven, which removes more than 600 trees each year. The city gives the trees to City Bench, along with a space to mill the wood. The company donated the benches to City Hall as a thank you gift. Wood from a tree that fell on Southern’s campus will become a work of art in the hands of Benjamin Komola, ’11. Doctor Who, What, When, and Why In the process of earning his Ph.D. in England, Mark McRiley, M.P.H. â&#x20AC;&#x2122;12, sets out to investigate opiate use on both sides of the Atlantic. celebration will continue on Oct. 30 when the class holds a reunion on campus the day after Homecoming. For more information, call Alumni Relations at (203) 392-6500.
contacting Michelle Johnston, director of the Office of Alumni Relations, at JohnstonM2@SouthernCT.edu or call (203) 392-6500. For more on future events go to SouthernCT.edu/alumni/upcoming-events. On June 15, the ScSU New London county and Southern rhode Island Network was kicked off at a gathering at the Saltwater Farms Winery in Stonington, conn.
click on “SCSU Student Publications” to view an assortment of student newspapers and yearbooks dating back to 1929. The event will include a wide range of family-friendly activities, including the student parade of the floats, the alumni tent party, and the Homecoming football game. (The game kicks off at 3 p.m.) tHe claSS of 1966 will hold its 50th reunion at the university on Oct. 30. lookIng forward, tHe claSS of 1967 will be recognized in honor of its 50th reunion at the undergraduate commencement ceremony in May 2017. For more information or if you would like to organize a reunion for your class, please contact Alumni Relations at (203) 392-6500. Held on oct. 29. SuSan deMIng corneIlle, ’64, M.S. the chief research archivist of the Yale University Library for more than 40 years. She was recently featured in an article in the Hartford Courant. ’76, was appointed to the Culture and Tourism Advisory Committee for the state of Connecticut. She is the executive director and founder of the Wallingford Center for the Arts and the Wallingford Community Theatre. appointed president of Dune Medical Devices in Atlanta, Ga. Her husband, StePHen cHMura, ’89, is a graduate of Southern’s School of Business. wo southern graduates are among a total of only 10 librarians chosen from throughout the nation to receive the “i love my librarian award.” the competition, which is overseen by the american library association, recognizes librarians who have transformed lives through education. here’s more on the honorees. Elizabeth Rumer y, M.L.S. ’05 library director, university of connecticut avery Point campus, groton elizabeth rumery has rolled out the welcome mat for students and the community, says sue shontell, executive director of the new london housing authority, (nlha), which provides housing opportunities for the elderly, those with disabilities, and lowincome families. in addition to welcoming nlha families and staff at on-campus events, rumery has encouraged her students to learn the joys of giving back. “she has made the library not only a place of academic learning and support, but a place to learn life lessons as well,” says shontell. on campus, rumery has worked to enhance the library’s physical space and fostered collaborations with veterans, the rainbow center, and the writing center. she’s also created a “safe space” in the library, where students grappling with problems and issues will be connected with the appropriate help and resources. Bertil nelson, ’61, M.S. ’67, is the author of the novel “Maddoc,” the story of a former member of the New York Police Department who sets out to find his missing daughter and avenge his wife’s murder. Sandy Myerson, ’69, is the author of “Elder Care Assistance, A Practical Guide Covering Health, Financial, and Legal Considerations.” Mary Mahony, ’70, published her seventh book in December, “Charlotte the First,” a story about sibling rivalry and finding a special place in the family. Bob rynecki, ’73, M.S. ’77, has written a book for nurses and paramedics entitled, “The Art of the IV Start,” which details techniques for successful intravenous lines. He lives in Chambersburg, Pa. len yannielli, M.S. ’74, M.S. ’89, announces the publication of his latest novel, “Hurry Down Gunntown, A Small Town Saga of a Stolen Boy and Land Saved.” He lives in Naugatuck, Conn.
sports performance coach, is the director of the conditioning camp being offered through the Shelton Parks and Recreation Department in Connecticut. exhibited at the Discovery Museum in Bridgeport, Conn. An art teacher at Newfield Elementary School in Stamford for three decades, she lives in Milford, Conn.
James r. Benn, M.L.S. ’76, has published “Blue Madonna,” the latest in his Billy Boyle World War II mystery series. He recently spoke about his work with the Friends of the Watertown Library. Stephanie robinson, ’97, M.L.S. ’05, is the co-author with Jessica Haight of “The Secret Files of Fairday Morrow” (Penguin Random House), an action and adventure book for middle grade children. Susan Strecker, M.F.T. ’97, has published her second novel, “Nowhere Girl” (Thomas Dunne Books), the story of a writer of thrillers who begins to uncover the truth about her twin sister’s death sixteen years prior. director of the Stratford Library. Previously, she was with the Trumbull Library System. She lives in Monroe, Conn. named director of the Nevada Department of Corrections. He brings nearly three decades of corrections experience to the position, including formerly serving as commissioner of the State of Connecticut Department of Correction and as first deputy commissioner of the New York City Department of Correction. david r. diSarro, M.A. ’06, has published a poetry collection entitled, “I Used to Play in Bands.” He is an assistant professor of English and the associate dean for academic resources at Endicott College in Beverly, Mass. diana dart Harris, M.S. ’08, is the author of “Beginning Musical Theatre Dance,” a comprehensive beginner’s guide to preparing dancers for the intersection of music and theater. aging editor at the Bristol Press in Connecticut. He lives in West Hartford. Brendan w. walsh, M.F.A. ’13, is the author of “Go,” a fulllength collection of travel poetry about his experiences at home and abroad. Walsh is the assistant director of international education at Southern. Patrick cumpstone, ’15, who teaches world history at a Hartford magnet school, has published his first book, “Connecticut Witchcraft: Witch-Speak and Social Unrest in 17th Century Connecticut” (Picton Press). The book is the culmination of his undergraduate thesis at Southern. head coach of the Mexico national soccer team. WTNH-News 8 team. She earned her master’s degree in forensic psychology at the University of New Haven and lives in Suffield, Conn.
from the Connecticut Police Academy and is an officer in Groton. JeSSIca HodorSkI guenIat, M.L.S. 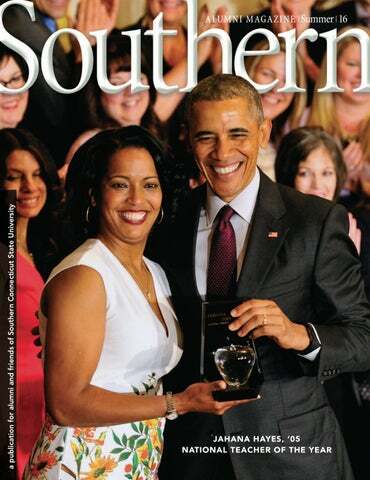 director at Southern, was featured in an article in the February 2016 issue of New Haven magazine. Sacred Heart Academy in Hamden, where he will teach physics and astronomy, and will co-moderate the Science National Honor Society. Litwin lives in Orange, Conn.
2015, Derby, Conn. rayMond defranceSco, ’53, Nov.
Jan. 31, 2016, Sudbury, Mass. 2015, Milford, Conn. dennIS J. anderSon Sr., ’63, M.S. Severn, Md. ralPH M. clark, ’66, M.L.S. ’69, Dec.
2014, Old Lyme, Conn. JaMeS a. PanIco, ’66, 6th Yr. ’69, Feb.
2016, Meriden, Conn. SHaron laISt, ’68, M.S. ’76, 6th Yr.
Dec. 12, 2015, Fort Lauderdale, Fla. dale SalIMeno, ’69, M.S. ’70, 6th Yr.
’87, Jan. 23, 2016, New London, Conn.
Streeter roy SeIdell, ’71, 6th Yr.
Yr. ’74, Feb. 5, 2016, Ft. Meyers, Fla. conStance J. JoneS, M.S. ’72, Jan.
29, 2016, Woodbury, Conn. Beverly MIglIetta, M.S. ’72, 6th Yr.
2015, East Haven, Conn. wIllIaM H. weaver, M.A. ’73, Oct.
2015, East Haven, Conn. Suzanne tHerIot StISSer, ’74, Jan.
Sept. 24, 2015, Oakland, Calif. Helen r. lanSBerg, M.L.S. ’75, Feb.
Feb. 20, 2015, Norwalk, Conn. BarBara kaMay-Haggerty, M.S. 2015, West Haven, Conn. wIllIe tHoMaS Boyd, M.S. ’81, Jan.
2, 2016, Wallingford, Conn. wIllIaM l. Brackett, 6th Yr. ’87, Jan.
Jan. 23, 2016, Hartford, Conn. antoInette tarInI, ’87, M.S. ’93, Jan.
Nov. 6, 2015, New Haven, Conn. loraIne Magee forMer, ’91, Sept.
2015, Brentwood, Tenn. annette MarIe gardner, 6th Yr.
2016, Hamden, Conn. MonIca Sardana, ’04, M.A. ’11, Feb.
March 13, 2016, Stratford, Conn.
WITH SOUTH ERN FRIENDS AND CLASSMATES. “I have to downplay it somewhat, but I am still that 8-year-old kid who wants to grow up and work at Marvel. Take Neal Adams. [Adams created some of the iconic modern imagery for DC Comics’ Superman, Batman, and Green Arrow.] If there was a Mount Rushmore of comics, he would be one of the four heads. I will always see him as legendary — and I have the opportunity to sit and talk to him. And I get to bring him to TerrifiCon™ — so others who feel exactly the same way get to see him, too.” He says he’ll always be a fan -- and here’s one reason why. “We weren’t the wealthiest people in the world, and it wasn’t always easy. That’s one of the things about comic book heroes. They’re from poor families. They have problems. Peter Parker is living with his aunt who is sick. He’s a scrawny guy, not popular. Then he gets bit by a radioactive spider, and he becomes Spiderman. It’s inspiring. It gives kids a reason to stay on the right path. It gives you hope.” And he’ll never tire of meeting his fellow fans at TerrifiCon™. Spouse’s Name ____________________________________________________ SPOUSE'S SCSU DEGREE/YR. avenue in the former home of the office of admissions. Plan C? We want to do what’s good for the country,” he says. Meanwhile, Dot Com Zambia’s success is both measurable and motivational. carr, professors of art at Southern, with honing his “sense of design and style.” “Being able to look at something and know what’s aesthetically pleasing . . . I picked that up from them,” he says. chris d’elia Sept. 9 | 8 p.m. The charismatic, highenergy comedian has built a fan following with Netflix and Comedy Central specials — including the Justin Bieber roast. Sept. 24 | 8 p.m.
undergraduate admissions open House oct. 23 | 11 a.m. – 2:30 p.m. Launched in 1968, the horn-driven jazz greats regularly play to sold-out crowds around the world. oct. 28 | 8 p.m.
dec. 10 | 8 p.m.
Back by popular demand, smooth jazz at its finest with a dash of holiday cheer. Share your Owl pride with friends and family while enjoying a daylong series of events, including the Homecoming parade, alumni tent party, campus tours, children’s activities, Homecoming football game, and more. oct. 29 | 8 p.m. Pushing the boundaries of the jazz scene, the awardwinning multiinstrumentalist crosses the genres of contemporary jazz, R&B, and funk. Explore programs and meet graduate faculty in more than 40 areas of study in education, business, health and human services, and the arts and sciences. Many programs offered with Connecticut teacher certification. oct. 7, 8, 13-15 | 8 p.m. oct. 9, 15-16 | 2 p.m. The first professional dance company in the world dedicated to the tradition of stepping. nov. 19 | 8 p.m.
nov. 17 | 7 p.m.
oct. 6 | 3 – 7 p.m.
u.S. army field Band and Soldiers’ chorus nov. 6 | 3 p.m.
*only $120 for four great shows! we would like to thank the following members of the Class of 2016 who graciously made a donation to SCSU in 2016. these students’ gifts — a sign of their dedication to Southern — will make a significant impact for future owls! Every Student Has a STORY. A tax-deductible gift of $35 or more each year entitles you to active membership in the Alumni Association. Contributions made through April 30, 2016.
opportunities for students. Dean Breese lauded Rebecca Goodheart, Elm Shakespeare’s new producing artistic director, and Kaia Monroe, Theatre Department chair, for helping bring the partnership to fruition. For more Theatre Department achievements, see page 9.